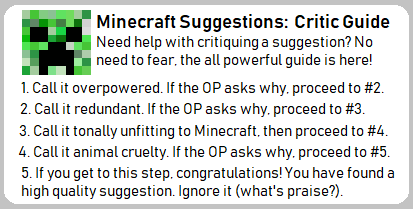 Currently, there's not really a way to stop minecarts immediately other than to have a piston block the cart. However, using a piston to stop the cart is not always practical, so what about a brake rail? When powered, the brake rail will almost instantly bring any minecart on top of it to a screeching stop, and little fire particles will momentarily appear as sparks. Ah, I wasn't aware of that. Honestly I think the brake is easier to use and has its own purpose, though; sometimes you might need something that can either be a normal rail or a brake rail depending on whether it's powered. Personally, I prefer the versatility of the powered rail. Why separate tasks into different blocks when you can have one block that does several things? It saves space. Oh wait, Mojang is splitting up the crafting table in the next update, isn't it. I guess it's a toss up. Also, nice job proposing a recipe that uses iron nuggets. Having something to do with them would be nice. Inactive powered rails do the same thing your suggesting though. If you place those down with no redstone signal your cart slows down pretty fast. Maybe a good idea for this would be to have it stop, then if you move it like you normally would without a power rail, it would move normally. Otherwise this is already in the game as inactive power rails.